My niece is now a teenager! How the $*#&@ did that happen? Wasn’t she just born? Oh, Maddie. Way to make Aunt Miss feel old. One of these days, I’ll make a pretty cake. Sigh. Remember, this is my chocolate-hating niece. I know, crazy. 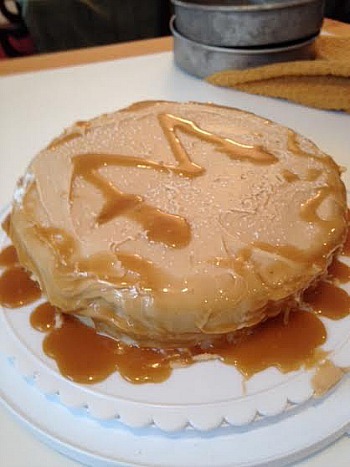 But when I suggested salted caramel cake she got very excited…and so did I. 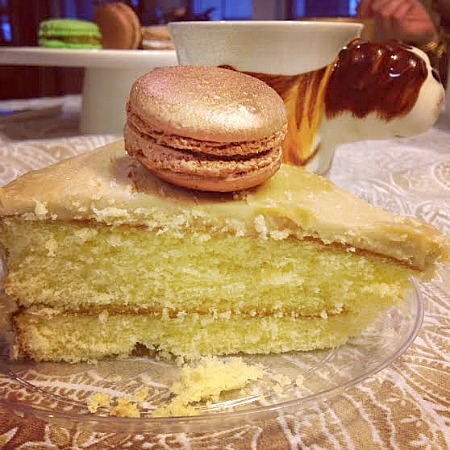 Yes, that’s a salted caramel macaron on top of a slice of salted caramel cake. Indulge much? Sure do. And if you’d like to indulge in these delicious macarons yourself (in just about any flavor you can imagine!) you should contact my sister. 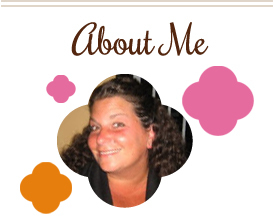 Check out her website HERE and place your orders – you’ll be happy you did! And now for the recipe, which is not for anyone looking to stay on their diet! But mark my words, this is one DELICIOUS cake…yum! Preheat oven to 350 degrees. Grease and flour 2 round (9 inch) cake pans. Cream butter until fluffy. Add granulated sugar and continue to cream well for 6 to 8 minutes. Add eggs 1 at a time, beating well after each addition. Add flour and milk alternately to creamed mixture, beginning and ending with flour. Add vanilla and continue to beat until just mixed. Divide batter equally among prepared pans. Bake for 25 minutes or until golden brown. While cake is baking, combine butter, brown sugar, and milk in a saucepan to make the filling. Cook and stir over medium heat for 3 to 5 minutes. Remove from heat and stir in vanilla. Remove cake layers from oven and allow cake to remain in pans as you prepare to stack and fill. Remove first layer and invert onto serving platter. Pierce cake layer with a toothpick over entire surface. Spread half of the filling mixture on the cake layer. Top with second layer, and repeat. Place leftover filling into a piping bag to drizzle on sides of cake after it’s frosted (or skip the bag and use a spoon, like I did). To make the frosting, melt butter in a saucepan over medium heat and stir in brown sugar and cream. Bring to a boil, and transfer to a mixing bowl. Add powdered sugar and vanilla. Beat until it reaches a spreading consistency. Add extra heavy cream slowly, and a little at a time, if it’s too thick, until desired consistency is reached. Frost cake and sprinkle sea salt on top. Using piping bag or spoon, drizzle remaining filling along sides of cake. The frosting hardens FAST, so be prepared to act quickly! This entry was posted in cake, dessert, family. Bookmark the permalink.